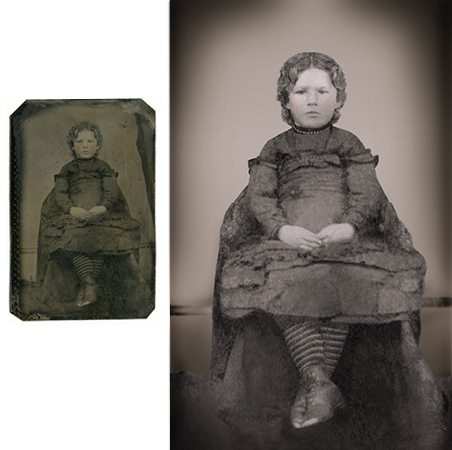 The history of photographic processes is a history of improvements in the ease of making a photograph, but not necessarily the longevity of the image. Photographs from the 1950's can be more faded than ones from late 19th century. The chemicals used to produce a photograph are often the ones that cause the most damage, particularly if not properly washed out of the print by the photo lab. Other problems include mold, foxing (brown stains) and discoloration from exposure to acid papers and glue stains—frequently from improper storage in an album. Color photographs have problems of their own. The dyes used to create color images have varied over the years and again the age may not always be the only factor. While black and white photographs generally do not fade from sunlight, color photos can lose their color rather quickly. But to make matters worse, color in photos do fade even in the dark. Almost all color prints after the mid-1970s are on a plastic coated paper that is prone to cracking or small breaks in the emulsion if not kept perfectly flat. Finally, let's not leave out damage from other "natural causes." Water generally does not have a negative effect on photographs since they are exposed to baths of water in the processing. However when you add water to framed photos or an album full of family photos, damage can often be extensive. In these cases it is best to not try to remove the photos once the water has dried. Likewise photographs that are severely curled should not be unrolled. 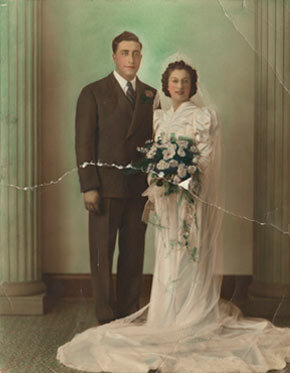 We are experienced in dealing with these issues and can often provide some relief before we begin digital restoration. We are able to restore most photographs that are beyond conventional repair. In fact, we have done a number of restorations that others have said could not be accomplished. For that reason, and our experience in handling important historic images, historical societies have allowed us to work on images that are normally not let out of the building or entrusted with any outside vendors. With over 20 years experience using the most advanced computer technology, we can copy and then restore, enhance and correct images. Once a new digital file has been created our archival printers can match the original tones of any black and white paper or produce the full color of color photographs or historic hand colored photos. 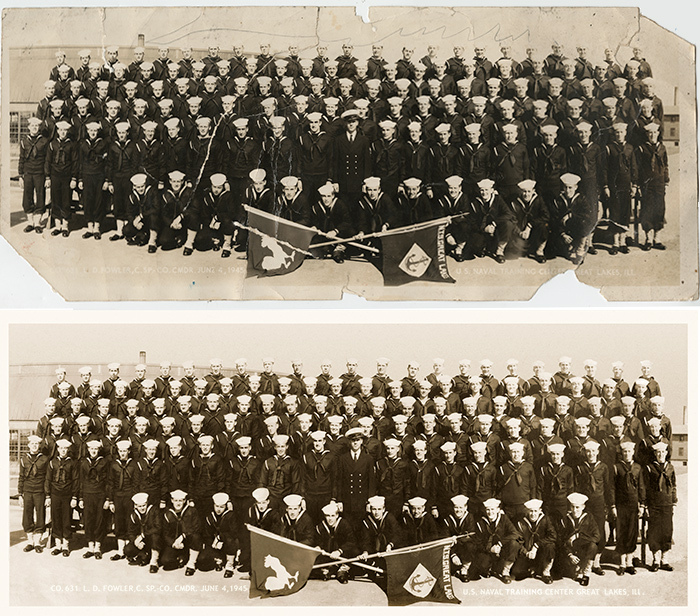 As imaging experts we know what different vintage photographs looked like when they were new. We are a complete imaging studio that specializes in working with restoration clients from all over the country. We are located in the Mississippi River valley near beautiful historic Red Wing MN. Contact us for more information on helping restore your precious photos. Or better yet if you are in Minnesota, Wisconsin or Iowa call for an appointment at 715.792.5556 to visit our studio and to find out how we can help you. We are less than an hour from Minneapolis, Rochester, St. Paul, Bloomington and Menomonie Wisconsin. Also, we often available at night and weekends in addition to normal business hours to best work with your schedule. We can often provide hand delivery at no additional charge on most orders to the Twin Cities metro area and parts of Western Wisconsin. Of course we are also experts in shipping valuable items. We can offer help in getting your damaged photos to us safely and returned back to you. A few years ago the Bubbler (The Wisconsin portal) chose us as the site of the week for our restoration work. Alas, they are gone, but we are still here doing the finest in restored photography and documents. Civil War Tintype 2X3 inches. Restored and Enlarged to 5X7 inches.. The history of photographic processes is a history of improvements in the ease of making a photograph, but not necessarily the longevity of the image. Photographs from the 1950's can be more faded than ones from late 19th century. Other problems include mold, foxing (brown stains) and discoloration from exposure to acid papers and glue stains—frequently from improper storage in an album. Color photographs have problems of their own. The dyes used to create color images have varied over the years and again the age may not always be the only factor. Almost all color prints after the mid-1970s are on a plastic coated paper that is prone to cracking or small breaks in the emulsion if not kept perfectly flat. Finally, let's not leave out damage from other "natural causes." Water generally does not have a negative effect on photographs. However when you add water to framed photos or an album full of family photos, damage can often be extensive. In these cases it is best to not try to remove the photos once the water has dried. Likewise photographs that are severely curled should not be unrolled. We are experienced in dealing with these issues and can often provide some relief before we begin digital restoration. 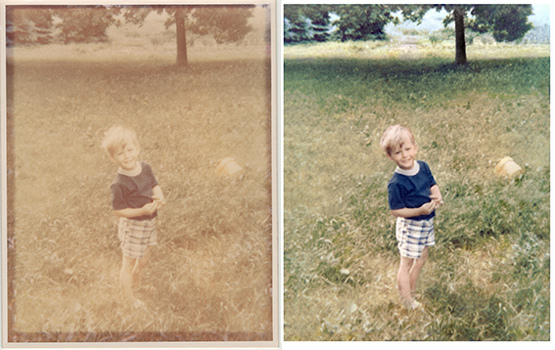 Fortunately, we are able to restore most photographs that are beyond conventional repair. In fact, we have done a number of restorations that others have said could not be accomplished. For that reason, and our experience in handling important historic images, historical societies have allowed us to work on images that are normally not let out of the building or entrusted with any outside vendors. With over 20 years experience using the most advanced computer technology, we can copy and then restore, enhance and correct images. Once a new digital file has been created our archival printers can match the original tones of any black and white paper or produce the full color of color photographs or historic hand colored photos. We are a complete imaging studio that specializes in working with restoration clients from all over the country. Of course we are also experts in shipping valuable items. We are located in the Mississippi River valley near beautiful historic Red Wing MN— less than an hour from Minneapolis, Rochester, St. Paul, Bloomington and Menomonie Wisconsin.